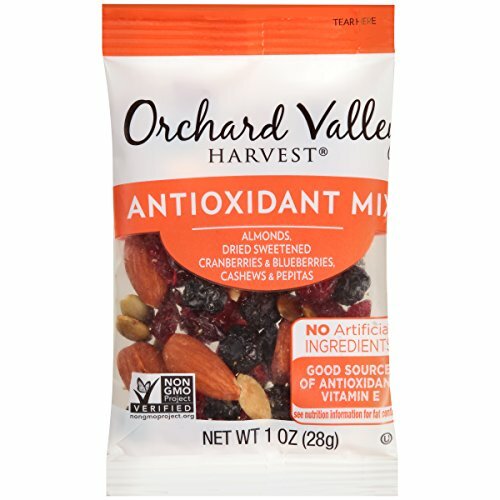 Orchard Valley Harvest Antioxidant Mix Multi Pack, 8 ct. I like healthy snacks – especially individually packaged ones to prevent me from eating 2 or 3 servings at once. Hurry and get the Orchard Valley Harvest Antioxidant Mix Multi Pack, Non-GMO Project Verified, No Artificial Ingredients, 8 ounces today for only $8.99 $5.98 from Amazon. Check out all of the recent Amazon deals here! Orchard valley harvest is dedicated to finding pure and simple nuts and dried sweetened fruits that support your healthy lifestyle. Our products come right from mother nature and do not contain any artificial colors, flavors or preservatives. Enjoy the delicious taste of our antioxidant mix and feel nourished and satisfied. Buy the Orchard Valley Harvest Antioxidant Mix Multi Pack, Non-GMO Project Verified, No Artificial Ingredients, 8 ounces from Amazon.